Time and again, Hindu sages using the rudraksha have been highlighted. Why use this rudraksha ? What is the benefit ? Rudraksha or Rudraksh or Rudraksham, is regarded in Hindu religion as a divine power bead traditionally used as prayer beads by Hindus. 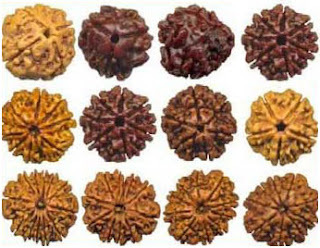 Rudraksha is a red colored berry of Rudraksha tree usually found along the Himalayas. Rudraksha is a Sanskrit word and the combination of the names Rudra (Lord Shiva , the Hindu God) and Aksha (Eyes). The name itself tells us about the effect of seed on evil and negative effects where Rudra means terrible and Aksha means eye. As per Hindu mythology, the religious text of Devi Bhagawat Purana says that there was a demon in the name of Tripurasur. He was very strong and had divine powers. Having these qualities his pride increased and he started disturbing deities and sages. Everybody tried out but no one could defeat this strong asura. All other Lords prayed to Mahadev Shiva to demolish Tripurasur for his immoral actions. Lord Shiva killed Tripurasur with his weapon called Aaghor but the weapon was so dazzling that even Shiva had to close his eyes. When he opened his eyes water ran through his eyes and this felt on the earth. Wherever the tear drops fell Rudraksha trees started to grow up. The fruit that grow on this tree is called Rudraksha. Scientific research says that Rudraksha beads have some electrical and magnetic powers. Researches also say that when there is a difference in the faces seen in Rudrakshas then they have different electromagnetic properties. Rudraksha beads are composed of carbon, hydrogen, nitrogen, oxygen and some trace elements. Rudraksha bead are available in 1 to 108 faces, however currently 2 to 21 faces are only available in common. Single faced Rudraksha seed is rarely available, while some people claim that 22 to 108 faces Rudraksha plants are still found in the foot hills of Himalayas and Mansarovar regions. The electromagnetic properties in Rudraksha have the ability to affect neuro physiology of human beings. The beads also have anti aging factors also. It is proven that Rudraksha seeds impart positive changes in the bioelectrical system of the human body in a life supporting manner. Details of the popular 14 types of Rudraksha Beads and its significance. There are many types of Rudraksha Beadsfrom one faced Rudraksha to 108 type Rudraksha. However not all of them are available nowadays and only the first fourteen types are popular. Below are the details of 14 Types of Rudraksha beads and their significance and representing Gods. The one faced Rudraksha beads are very rare to find and hence are very costly. It represents Lord Shiva and wearing this one gets rid of all past sins. The person wearing this gets all pleasures in life and also cures the negative effects of Hindu Sun God and the individual charms like Lord Suryahimself. Two Faced Rudraksha bead showers domestic pleasures in couples for fulfilling long lasting relationships as it represents Lord Ardhanariswara (Ardhanareeswara or Uma Maheswara). Here there is a harmony between energies of both male and female and it is a bead for improving relationships. The bead controls the negative effects of Hindu Moon God and it stabilizes the mind of the person wearing it. The deity represented in Three faced Rudraksha is Lord Agni (Hindu God of Fire) which gives the wearer a confidence and energy to tackle any situation. It reduces the negative effects ofLord Mangal (Kuja or Planet Mars) and increases the energy levels in the body. It also keeps a control of temperaments of the person wearing it. Lord Brahma , the Hindu God of creation and Imagination , is the deity represented in Four faced Rudraksha and so increases the power of thinking. It removes the negative effects of Lord Budha or Planet Mercury and helps the wearer in developing speech. It also helps people with respiratory tract problems. Five faced Rudraksha is the most yielded bead among all other Rudraksha beads. This is a bead of good luck and represents Lord Shiva. This bead cures the negative effects of Lord Brihaspathi or Planet Jupiter and calms the mind of the wearer and protects him from all adverse situations. The God of Six faced Rudraksha is Lord Kartikeya or Lord Subramanya who blesses the wearer with victory and wisdom. The negative effects of Lord Sukhra or Planet Venus are controlled in the wearer and it gives the power of attracting other individuals. The Hindu God of Seven faced Rudraksha is Goddess Mahalakshmi, the goddess of wealth. The bead controls the negative powers of Planet Saturn or Lord Shani and the wearer never faces poverty. The bead is usually kept in the place of worship and not worn on the body. The deity of Eight faced Rudraksha is Lord Ganesha and so the person wearing this will never have any obstacles in his path and will enjoy professional success. This bead cures the negative effects of Rahu and is excellent for people havingSarpa Dosha in their horoscope charts. This is a very beneficial bead. The representing deity is Aadhya Shakti Maa. This bead is worn by Devi Bhaktas and it cultivates patience in the wearer. Negative effects of Ketu are controlled by this bead and it supports mastering foreign languages. Lord Mahavishnu is the regarded as the God of Ten faced Rudraksha. Creating a feeling of security, this bead helps the wearer to overcome difficult times. There is no ruling planet for this bead and gives the power of concentration. The representing deity of Eleven faced Rudraksha is Lord Aanjaneya or Hanuman. More beneficial for women this bead gives her a caring wealthy husband and is blessed with male progeny. The wearer knows no fear and it protects the wearer from Aakal Mrityu or sudden death. Lord Surya is the represented deity of Twelve faced Rudraksha bead. Negative effects of Sun God are controlled and help in ruling and creating a powerful aura. This bead can be worn by those who cannot acquire a single faced Rudrkasha as these both have similar effects. The representing deity of Thirteen faced Rudraksha is Lord Indra, the Hindu God of Devas. This is a very rare bead and showers the wearer with all worldly comforts and authority. The wearer is equivalent to a King and individuals become victorious in challenging situations. The representing deity is Lord Hanuman. It is a powerful bead and it shows instant effects and original 14 faced Rudraksha is very hard to find. The negative effects of Planet Saturn or Lord Shani are controlled by this bead and the wearer develops the quality of successful prediction and achieves every difficult goals. 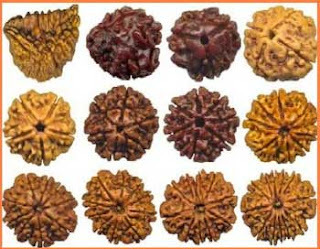 As you can see, the Rudraksha has a lot of divine inner meanings and health benefits . It is said that sages of ancient times used to travel around with the rudraksha and used to seperate the evil food from the good ones using the rudraksha. If the rudraksha turns in the anti clockwise direction, the the food is not healthy for the human body.